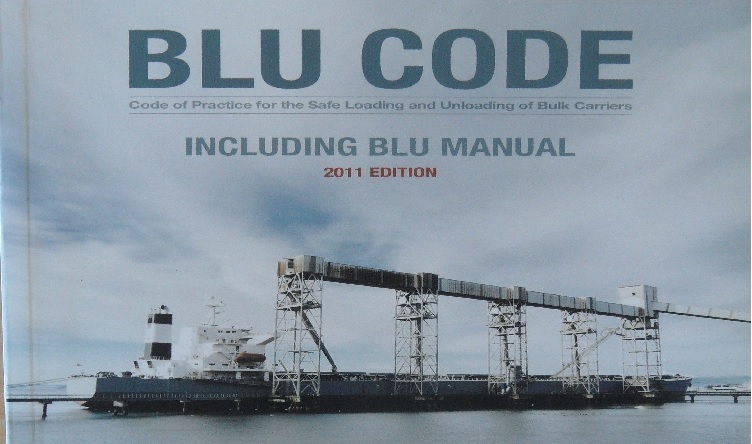 “BLU Code” means the Code of Practice for the Safe Loading and Unloading of Bulk Carriers, as contained in the Annex to IMO Assembly Resolution A.862(20) of 27 November 1997, as it stands on 5 February 2002. The purpose of the Code is to assist persons responsible for the safe loading or unloading of bulk carriers to carry out their functions and to promote the safety of bulk carriers. The Code primarily covers the safety of ships loading and unloading solid bulk cargoes, excluding grain, and reflects current issues, best practices and legislative requirements. Broader safety and pollution issues such as those covered by the SOLAS, MARPOL and Load Line Conventions are not specifically included in the Code. This Code of Practice for the Safe Loading and Unloading of Bulk Carriers has been developed by the International Maritime Organization to minimize losses of bulk carriers. It is recommended that a copy of this Code be made available to every ship, charterer and bulk loading or unloading terminal so that advice on operational procedures is readily available and respective responsibilities are identified. The recommendations in this Code provide guidance to shipowners, masters, shippers, operators of bulk carriers, charterers and terminal operators for the safe handling, loading, and unloading of solid bulk cargoes. The recommendations are subject to terminal and port requirements, or national regulations. Persons responsible for the loading or unloading of bulk carriers should also be aware of such regulations and requirements.